Aug. 27, 2009 - PRLog -- The Leon H. Sullivan Foundation will host their Sixth Awards Ceremony at the John F. Kennedy Center for the Performing Art in Washington DC on August 27, 2009. The honorees will be celebrated for their advocacy, humanitarian efforts and contributions to helping the poor and disadvantaged worldwide. The 2009 Honorees are Founder, Wheels to Africa, Winston Duncan; actress/activist, Mia Farrow, scholar and educator, Dr. Henry Louis Gates; composer/musician Herbie Hancock; mobile communications entrepreneur Dr. Mohamed Ibrahim; Grammy-award winning conductor, producer/arranger, Quincy Jones; and actor/producer/playwright, Tyler Perry. 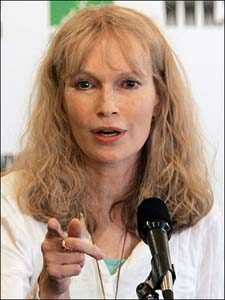 The program will also include a special performance poetry and song tribute presented by Nigerian poet and vocalist Iyeoka Ivie Okoawo to Mia Farrow who has stood at the forefront of advocacy for the underprivileged in Africa for years working tirelessly to raise awareness and funds for children in those afflicted areas. Like Ms. Farrow, Iyeoka uses her position in the spotlight to work for positive social change. As official spokesperson for the Amenawon foundation, a non profit focusing on projects in smaller villages that often fly under the radar of international resource pools, Iyeoka uses her inspiring poetic abilities to raise awareness of global public health issues and speaks out on how these challenges resonate in the lives of rural villagers in Nigeria. The honorees will be celebrated Thursday, August 27, 2009 at the John F. Kennedy Center for the Performing Arts (reception 6:30 p.m.; program 8:00 p.m.). Among many event highlights; Ambassador Andrew Young (the Chairman of the Leon H. Sullivan Foundation) will pay a tribute to His Excellency Mwai Kibaki, President of The Republic of Kenya. "We will always portray the best of Africa and bring the majesty of the continent to her lost sons and daughters," said Hope Masters, President and CEO of the Sullivan Foundation. "We are bringing the finest elements of Africa for everyone to enjoy; we are going to honor amazing people who contribute to making the world better." The evening also serves as a platform to showcase the Ninth Leon H. Sullivan Summit (The Summit) which will be held in Nairobi, Kenya July 19-23, 2010. Held every two years in Africa, the Summit is designed to enable African countries and other friends of Africa an opportunity to focus on economic empowerment, self-help, social responsibility and human rights. The Leon H. Sullivan Foundation is a 501c3 designed to carry on the spirit and legacy of Reverend Leon H. Sullivan, the great African-American international humanitarian who dedicated his life advocating for the poor and disadvantaged in Africa and worldwide.